Puffy eyes strike people of all ages. But it gets worse with age. Younger people might pass off puffy eyes as a side effect of an exciting night on the town. Older folks just look tired. But you don’t have to be a victim to puffy eyes. Here are some strategies for minimizing this unattractive look. 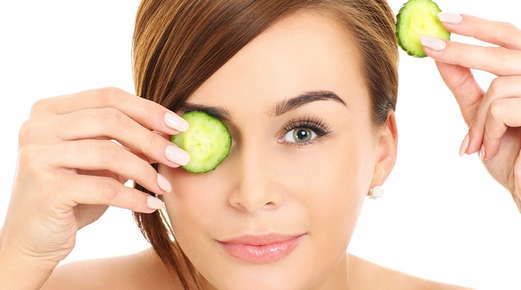 Ways of coping with puffy eyes range from simple and inexpensive to costly and invasive. Starting at the easy end of the treatment spectrum, cold compresses can temporarily diminish puffiness. Cucumber slices are a classic example, but other cold compresses – such as chilled spoons, potato slices or tea bags – work just as well. Over-the-counter creams made to reduce puffiness might work for you. Try a few from your beauty product purveyor. But avoid that infamous go-to trick of models: hemorrhoid cream. The sensitive skin around your eyes wants you to keep such irritants far, far away. A retinol cream made for eyes is much safer. There are several professional treatments designed to improve the look of your eye area. One such treatment is the application of contour pads soaked in a special mix of soothing botanicals that are placed just under the eyes. This treatment reduces the appearance of wrinkles, dark circles and under-eye bags. Another popular option a mini-treatment designed to boost collagen production around the eyes. Some treatments are done under the care of a dermatologist or plastic surgeon. Lasers can lighten the pigment of dark under-eye circles. Dermal fillers are a non-surgical option for people whose cheek deflation is causing their eye bags. A surgical procedure called blepharoplasty is the most permanent solution for under-eye bags. Heredity makes some people prone to under-eye bags and dark circles. But there are ways to minimize puffiness. Sleeping on your back. Side and stomach sleepers can wake with unwanted fluid accumulations under their eyes. Protecting the delicate skin around your eyes by wearing sunscreen, sunglasses and hats. Taking frequent breaks from screen time to reduce eye strain. We know how disheartening it is to wake up with puffy eyes. If you’d like to come in and try one of our relaxing eye treatments, give us a call today.